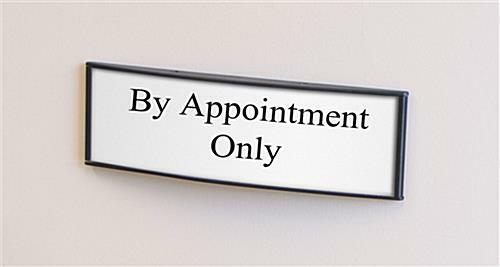 These Door Signs Can Serve as a Name Plaque in an Office! These Wall Plates Are Safety Sigange Holders with Metal Backing for Attachment Outside a Room! These Door Signs Are Available for Purchase! Media Size: 3" x 11.5"
2.5" x 8.5" 3" x 4" 3" x 5" 3" x 8"
3" x 15" 4" x 5.5" 4.5" x 24" 5.5" x 6" 5.5" x 9" 5.5" x 15" 6" x 7.5" 6" x 8.5" 7.5" x 10" 7.5" x 11.75" 8.5" x 11" 8.5" x 16.5" 11.5" x 17"
Each side comes with a non-glare lens to prevent tampering. Two-sided VHB tape is attached to the back of the frame for easy install. 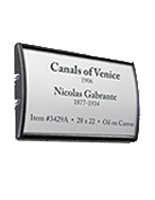 The anodized alumnium backer with black finish is designed to be durable. 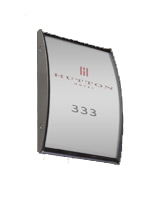 These door signs, similar to room number holders, will affix to the surface in portrait or landscape positioning. Users should choose the set-up that best fits the content. These door signs have a durable aluminum frame to last a long time. 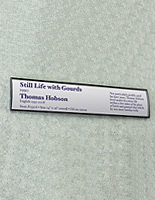 The room number holders come with double-sided VHB tape pieces on the rear side to quickly mount the models to the wall. These wayfinding door signs are the perfect tools for helping guests, visitors and potential clients from one area to another. 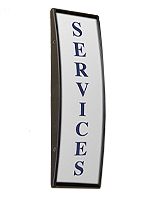 The office signage cases work well as a singular unit when presenting an important message. These door signs can also function in a group to provide way finding information! 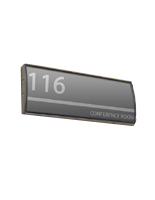 The room number holders are able to find a place in almost any business. 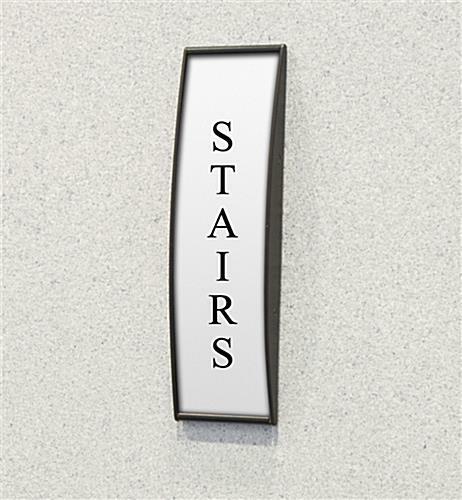 These door signs, commonly called name plates, are frequently implemented within medical centers, financial establishments, lobbies, businesses and educational facilities. 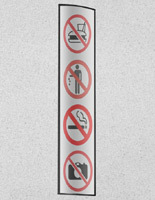 The wayfinding signage holders present the numbers of rooms, names of occupants, and a great deal of other information. These door signs feature an anodized aluminum extrusion fabrication with plastic end caps to make sure the units will last a long time. The convex shape attracts visitors coming from every direction because the messages really stand out! 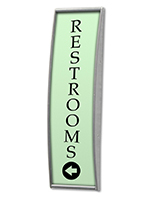 These door signs, also known as wayfinding signage holders, are convenient to alter signage. The provided suction cup will enable users to remove the plastic front and take out the messages. These door signs are perfect for establishments that need to replace the information all the time. 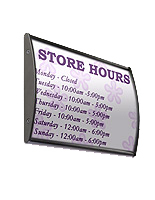 The non-glare overlay protects the content from both glare and potential damage. 3.4" x 14.5" x 1.0"